This tour includes a visit to the most famous Palace state with gilded statues and dramatic fountains. After Peter the Great established his new city of St. Petersburg as the capital of Imperial Russia in 1703, he needed a summer residence away from busy court life and the hot summer days in the city. And so, in 1714, he started to build such a place of rest and relaxation on the shores of the Gulf of Finland, about 30 kilometers (20 miles) from the city center. And what a place he built! Today, 300 years later,of thousands of people annually visit the place in order to see and marvel at its beauty and grandiosity. The entire area is so huge that it took a total of 150 years and several of Peter's successors' efforts to complete. It takes about an hour's drive to reach the old Russian village of Peterhof, in Russian Petrodvorets, where the palace is located. The complex consists of the main palace, about 20 smaller palaces and pavilions, and seven incredibly beautiful and peaceful gardens and park areas. Since there are several royal palaces in St. Petersburg, all built in the 1700s, and some superior, the main attraction is not the palace, but the park and fountain ensemble, which is a unique landmark of the Russian artistic culture and style. There are a total of 174 different fountains, and 4 water cascades, of which the most majestic is called the "Samson". It is a huge, wide, terraced cluster of fountains with numerous gilded and dramatic statues shooting water high up into the air. It has gained worldwide fame and has also become a symbol of the city – An inside visit to the Fountain Park of Peterhof. 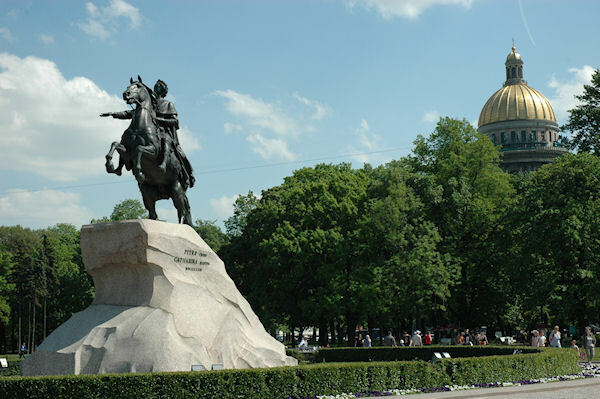 The parks also reveal some playful personality features of Peter the Great. We walk through these unforgettable parks. Some of the fountains are so called "trick fountains", which are activated by people walking on a cobblestone path, and not knowing on which stones to step. Peter always allowed his high-level guests to walk first on these narrow paths, and he himself, walking at a safe distance behind his guests, got a good laugh, while his victims received an unexpected and embarrassing shower. In Russia, the difference between a house and a palace is based on the number of rooms. A minimum of 30 rooms makes a palace. The huge formal palaces did not always provide privacy, which all the rulers longed for once in a while. In order to satisfy their desire, many of them had small detached houses built for their private life or use, where they were also able to live a "normal family life", with only a handful of their most trusted personal servants around. Here they enjoyed the privacy of their own family and invited close personal friends for quiet, informal get-togethers. Some of them even had their secret rendezvous with their lovers in these separate houses, often called mini-palaces. Before returning to the city we shall have a photo stop at the St Peter and Paul Cathedral at Peterhof, one of the very few ever built in the typical Russian Orthodox style in the St Petersburg area, including the onion domes. Photo Stops: St. Peter and St. Paul Cathedral in Peterhof.